9:00 am Sunday School for all ages! Please follow TV channels 3 or 30 for information regarding cancellation due to inclement weather. Childcare is available for infants and toddlers during both services. Hearing assistance devices are available at the Welcome center. A sign-language interpreter can also be made available during Sunday Service upon request. Please contact the church office at 860-745-5211 or via the website in advance of your visit so that we can schedule an interpreter to meet your needs. Following each service, please join us for a time of coffee and refreshments in the Fellowship Mall. 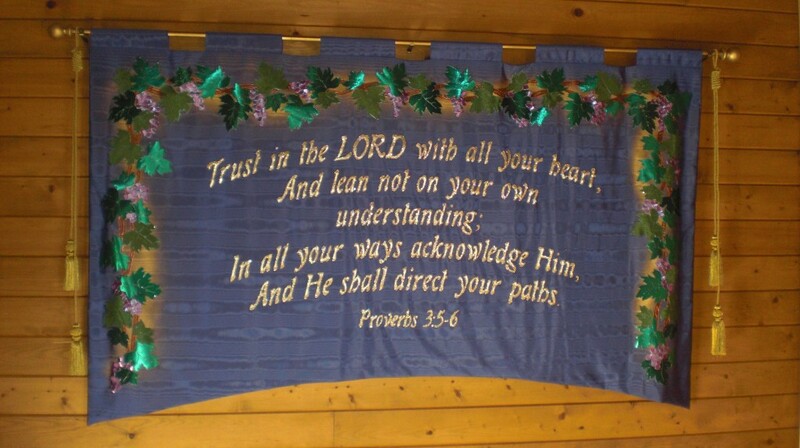 This banner hangs in our sanctuary to remind us to put our trust in God!